Bharat Swachata Abhiyan may have been started by the Prime Minister of India, but the capital of the country needs a stronger program to fight the pollution in the city. Smaller corporations and NGOs have taken up to cleaning the city through ‘Swachh Delhi’, but an official channel was still not available to track the pollution. A new app ‘Hawa Badlo’ has been introduced by Environmental Pollution (Prevention and Control) Authority for Delhi & NCR (EPCA), appointed by Supreme Court of India, to verify and keep a track of air pollution in Delhi and surrounding cities. The app is a collective effort of EPCA, municipal corporations and concerned departments of the state governments of Delhi, Haryana and Uttar Pradesh. 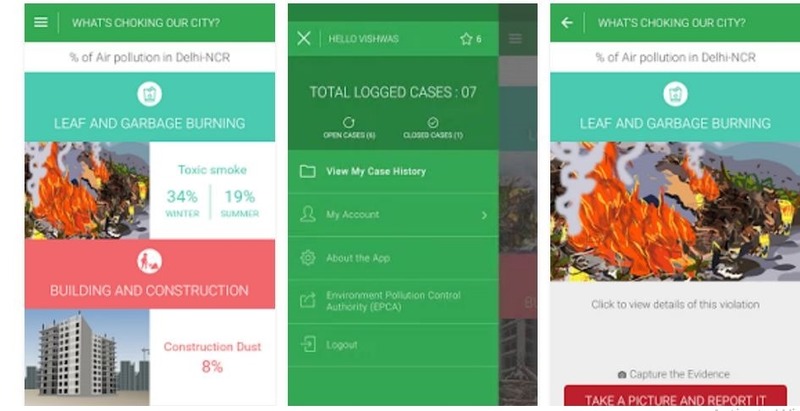 “The App aims at an inclusive participation of citizens in reporting incidences of leaf and garbage burning, building and construction dust and unpaved road dust, and thereby makes them part of the city’s fight to curb toxic air pollution,” said Bhure Lal, Chairperson – EPCA. The app is aimed at providing residents of Delhi-NCR to form a complaint in case of air pollution anywhere in the state, provide regular updates of the surrounding, thereby making them accountable for their environment too. This will also allow citizens to connect with Government officials. The concerned authorities will receive the incidents and offer their solutions to them. The photos or videos of the area will also be uploaded and updated on time to keep the residents abreast of the solutions. What is in the Hawa Badlo app? After downloading the app from Google Play Store or iOS Appstore, and on opening it, the app will request for a few permissions and request you to switch on GPS on your device. You will also have to login through either Facebook or Google to enter the app. Upon logging in, you will see statistics on the top pollution source in Delhi. Selecting either of them will take you to an animated page that offers information on sources of that kind of pollution. In case you see something similar around you, you can take a photo and lodge a complaint on the app itself. These photos can be taken after carefully understanding the source of pollution and uploading the photo on the app. A side slider appears that gives information on total logged cases, your case history, view cases by city, your account and general information about the app. At the moment, this app seems very basic and only allows you to keep a track of surroundings near you. As the app improves, we should be able to see environmental information like air pollution statistics at places it is measured, air pollution forecasts for the next couple of weeks and some information on ways to keep the environment clean. Now if you see someone’s car spitting out excessive smoke, or you see open burning of tyres and other similar materials, you know where you can report and incident and help make Delhi clean and secure. The state’s air pollution levels have crossed the dangerous mark and only initiatives like these can help bring them down. "EPCA Launches ‘Hawa Badlo’ app to Report Incidents of Air pollution in Delhi-NCR", 5 out of 5 based on 3 ratings.